Q: On January 16, Canada and the US gathered some of the UN Command sending states in Vancouver for a foreign ministers' meeting on the Korean Peninsula nuclear issue. The meeting called for the international community to continue its maximum pressure campaign against the DPRK. What is your comment? 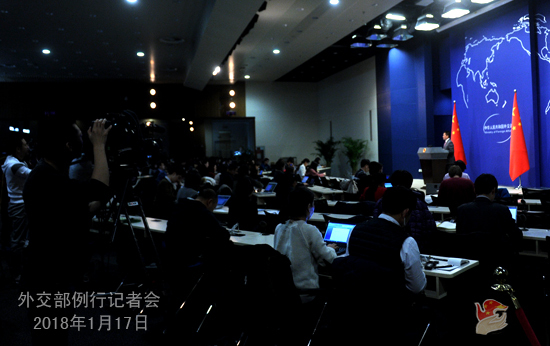 A: China's position on the Korean Peninsula nuclear issue remains unchanged. We are forever committed to achieving the denuclearization of the Korean Peninsula, maintaining peace and stability on the Peninsula, and peacefully and properly resolving the issue through dialogue and consultation. We have said many times that the nature of the Korean Peninsula nuclear issue is one of security. Only by addressing the legitimate security concerns of all parties in a balanced way through dialogue can we find an effective pathway towards the peaceful settlement of the Peninsula issue. To that end, China proposed the dual-track approach and suspension-for-suspension proposal. We see that the DPRK and the ROK are gradually resuming dialogues and contacts while the situation on the Korean Peninsula remains complicated and sensitive. All parties should cherish the hard-won momentum of easing tension on the Peninsula, supports efforts made by the DPRK and the ROK in improving ties, and double their commitment in alleviating the situation and promoting dialogues. Facts have proven that pressure and isolation alone is counterproductive. We all know that the so-called UN Command, as a product of the Cold War era, has long lost its relevance. As initiators of the meeting, the US and Canada co-hosted the meeting under the banner of the so-called UN Command sending states. That is Cold War mentality pure and simple, and will only drive a wedge among the international community and undermine the concerted efforts to seek proper settlement of the Korean Peninsula nuclear issue. When major parties to the Korean Peninsula issue are not present, such a meeting will not contribute to properly resolving the issue, as it shall be approached and addressed mainly through the framework of the Six-Party Talks and the UN Security Council. That is why, from the very beginning, the legality and representativeness of this meeting is extensively questioned by the international community. Q: Foreign Minister Wang Yi just wrapped up his visits to Rwanda, Angola, Gabon, and San Tome and Principe. Could you tell us more about the consensus and achievements reached during the four-state visits? What is the significance of the visits in terms of relations between China and the four countries? A: Foreign Minister Wang Yi just concluded his visits to Rwanda, Angola, Gabon, and San Tome and Principe. He is on his way back to Beijing. This trip marked the 13th visit he has so far made to Africa in the capacity of foreign minister and the 28th consecutive year that the Chinese foreign minister chose Africa as the destination of the first overseas visit. Foreign Minister Wang Yi met with the leaders and held talks with the foreign ministers of the four countries respectively. They had an extensive exchange of views on bilateral relations and cooperation, China-Africa relations and international and regional issues of common interests and reached important consensus. In Rwanda, the two sides agreed to step up exchanges to enhance political mutual trust, strengthen communication to deepen practical cooperation, conduct more people-to-people exchanges to improve mutual understanding, forge closer coordination, and elevate the collective capacity to deal with international and regional challenges. In Angola, the two sides agreed that the bilateral relationship is now at a crucial juncture where the past achievements need to be built on in order to usher in a brighter future, and the bilateral cooperation has reached a key stage for transformation and upgrading in order to achieve greater quality and efficiency. The two sides should review the past successful experience to innovate ways towards win-win results, uncover new cooperation fronts, and elevate the China-Angola strategic cooperation to a new level. In Gabon, the two sides agreed to flesh out the China-Gabon comprehensive cooperative partnership so that China and Gabon could become cooperation partners that trust and support each other, work side-by-side for win-win results, and jointly safeguard peace and security and address regional and global challenges. In San Tome and Principe, the two sides reaffirmed that the one-China principle is the political foundation for bilateral ties and would work on that foundation to consolidate political mutual trust and promote all-around friendly cooperation. The two sides are all satisfied with the fact that since the re-establishment of diplomatic ties, bilateral exchanges and mutually beneficial cooperation are resuming in various areas and tangible benefits are realized for San Tome and Principe. During his visits, Foreign Minister Wang Yi also briefed the African side on the 19th CPC Congress and the Summit of China-Africa Cooperation Forum to be held in China this year. He said that China would uphold the principle of shared benefits through consultation and contribution and work with the African side to advance the Belt and Road Initiative and usher in a brighter future for the China-Africa comprehensive strategic and cooperative partnership. The leaders and foreign ministers of the four countries offered their congratulations again to the successful holding of the 19th CPC Congress and pledged their positive role in ensuring a successful summit of the China-Africa Cooperation Forum and advancing the Belt and Road Initiative. Foreign Minister Wang Yi's visits were fruitful in that the traditional friendship between China and Africa was cemented, political mutual trust was enhanced, and mutually beneficial cooperation was strengthened. 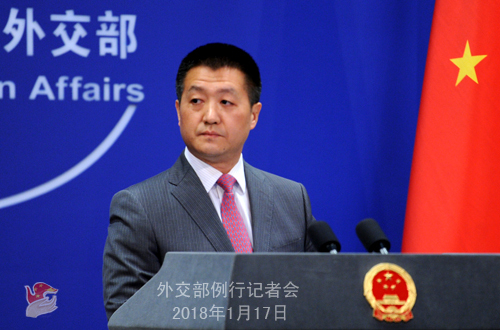 Going forward, guided by the principle of upholding justice while pursuing shared interests and the principle of sincerity, real results, affinity, and good faith, China will endeavor to elevate China-Africa relations to a new high. Q: According to China's Global Times, the western media is fueling a wave of Sinophobia in the west, one example being the obstruction of China telecom giant Huawei by the US government. What is your comment? A: I've already answered relevant questions. At the Foreign Ministry's regular press conference, in principle we rarely comment on specific cases of business cooperation. I want to point out however that the Chinese government always encourages Chinese enterprises to carry out mutually beneficial cooperation with other countries in accordance with market principles. Meanwhile, we also hope that relevant countries could level the playing ground and create favorable environment for Chinese enterprises to start businesses and pursue cooperation. We believe that it needs to be reciprocal and two-way.